Keep practices useful and fun—without burning yourself out. This week’s Tuesday Tips was written Geoa Geer. Send her thoughts, ideas, exasperations, and love to geoa.geer@gmail.com and check out more of her work on her Medium page. Tuesday Tips are presented by Spin Ultimate; all opinions are those of the author. Please support the brands that make Ultiworld possible and shop at Spin Ultimate! 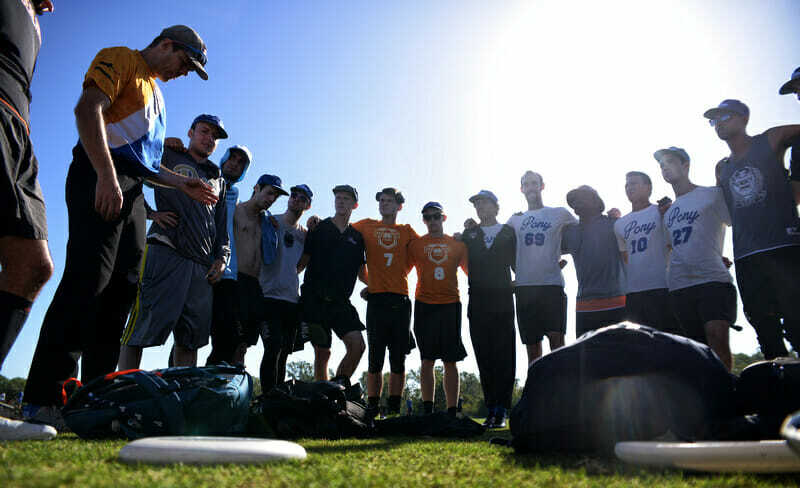 We’ve all done it: we sketch out grand plans for the upcoming season with detailed daily training plans, new zones, endless recruitment ideas, and at least five offenses. But believe me: you’re going to get bored, injured, frustrated, overwhelmed, or simply bogged down at some point this season. And that’s okay. Many teams hit a mid-season wall of exhaustion, too—life gets distracting without the adrenaline of looming tryouts or championships, you know? How do we keep practices interesting? Consider different teaching styles, spaces, and voices. Bring in outside expertise to give a weird, new day to your players. Where does one find these new perspectives? Honestly, most communities have an incredible wealth of knowledge, excitement, and simple joy for ultimate. Even in low-density areas, look at your beautiful team—why are they here? Why are they excited? What is each person really good at? Use the resources you have. Chat to your teammates, community members, neighboring club teams, retired players, and favorite idols from all over the world to get someone (anyone!) in for a session with your team. Different voices keep things interesting. A quiet week with an online clinic or discussion group or video session with outside people keep things new and engaging. Even if your guest coach repeats everything you’ve been saying all season, sometimes it takes that new voice for it to sink in. Getting an outside player to talk demands respect from the team, too. They might give you nonsense about being too lazy to listen, but bringing in an outside coach changes things. It’s a different mindset, learning from someone new. Whether it’s a teammate or friend, guest coaching is a fantastic experience for them to practice leadership. It’s also fantastic experience for your team to listen and learn from a new point of view—or to develop newfound respect for a teammate’s brilliance. But, probably most importantly, it gives you a day off to just sit and enjoy yourself and your team. Guest speakers means a beautiful, beautiful day off for you. Just like any tournament or scrimmage, playing against someone who doesn’t know your systems is a fabulous trial by fire. Have your guest speaker teach the offense against your new zone, a good defense for your horizontal, or even how to pull. Bringing new eyes (and brains) to the practice pushes everyone to think, adjust, and reevaluate their habits. What are our strengths? Weaknesses? How can we adjust? Is this zone actually effective? Is our primary cutter best used there? You never know what your guest speaker might notice. Hire your favorite physical therapist to do a session on injury prevention and running form. Everyone gets active feedback on their body mechanics—and how to be faster, safer, and stronger without adjusting much. Look into running coaches or chat to your local teams. Can you pitch in to get RenFitness, Tim Morrill, or Melissa Witmer to your city for a weekend? Or one of the newer ultimate trainers, like WischFit and PeaK Performance? What else would be fun to learn as a team? Can you host a nutrition session? What about forming cohorts to do the online Ulty Results Certification Program or RISE UP in small groups? Or maybe have a veteran coach or player host a film session where you break down the performance of recent College or Club champions? You don’t need to reinvent the wheel. Play (and run and train and think and lead) smarter, not harder. You’re not alone. I am a huge fan of taking a week off from one another. I am also a huge fan of taking a week off with one another. Look at your season. Is there a space to give your team 7-10 days off? Ultimate is like our part-time job and, well, any job needs vacation time. Give your players time to decompress, reengerize, get some space, and see their families. Alternatively or additionally, throw in two BBQs or a weekend retreat with one another. Go, hang out, play board games, swim in a lake. We play ultimate for the community, not to be grinding away all day. It’s okay to take a week off. It’s okay to have others teach. In fact, it makes your team better, prevents your burnout and mental exhaustion, and makes everything more fun. Comments on "Tuesday Tips: Getting Outside Help And Vocal Diversity Can Keep Practice Interesting, Presented By Spin"